In the world of flavors, corn and chocolate aren't often seen as the best of friends. So what happens when you add chocolate and barely noticeably peanut butter flavor to a classic cereal with corn in it's name? Original Corn Pops cereal (or as it was once known "Sugar Pops") has a distinct corn flavor that - to use an apropos description - "pops" when inundated with sugar. It's a classic flavor that has stood the test of time. It's disappointing to announce that this new cereal has very little of the corn-goodness taste that made the original so distinctive. This cereal is little more than Kellogg's version of General Mill's Reese's Puffs. The fact that it has any relationship to the classic Pops cereal is strictly a name recognition ploy. This cereal differs from the Reese's cereal in that it puts it's chocolate and peanut butter together in the same rounded cereal pieces. Reece's has a more distinct peanut butter flavor because it has peanut butter pieces and chocolate pieces side by side. 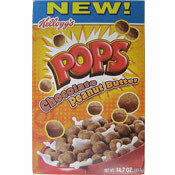 That said, Chocolate Peanut Butter Pops is still a tasty cereal. When stacked up against kids cereals like Cocoa Pebbles and Cocoa Puffs, it has heartier cocoa flavor. Anyone looking for a peanut butter cereal will likely be disappointed, even though peanut butter is mentioned in the ingredients before chocolate. What little peanut butter flavor there is adds a welcome complexity to the chocolate, but it's hardly enough of presence to be mentioned in the cereal's name. Each 3/4 cup serving of this cereal has 1 gram of saturated fat, 10 grams of sugar and only 1 gram of fiber. The bottom line is that there are better tasting cereals in the chocolate / peanut butter sector including Cookie Crisp, Reese's Puffs and Peanut Butter Cap'n Crunch. 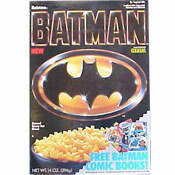 And if you're looking for a healthy cereal... look away from this one. What do you think of Chocolate Peanut Butter Pops? I found this cereal at a dollar store just to try it and now I'm addicted to 'em and I can't find them anywhere! Dollar store said they were discontinued! but why??? I have to agree with choco-woco. I am absolutely addicted to this cereal. I used to eat Reese's until I tried this Corn Pops with Choc and PB. The only reason I occasionally get a box with tiny hard pieces that make it very difficult to eat, but I've noticed the bad boxes are becoming fewer. Hmmm, I don't know about this stuff. I haven't tried it, and probably won't. I'll just get Reese's Puffs instead. terrible texture. Greasy, and had very hard grains of something inside that nearly broke my teeth. I actually enjoy Corn Pops and Reeses cereal (yummy)... very much so. The chocolate peanut butter pops are just airy chocolate pieces, with barely a hint of peanut butter. This new cereal is ultimately a texture nightmare missing an effective balance of tastes. I am addicted to these! I think there is a good mix of peanut butter and chocolate, and I think they are so much better than Reese's. Yes, they are nothing like corn pops, but still soooo good! !